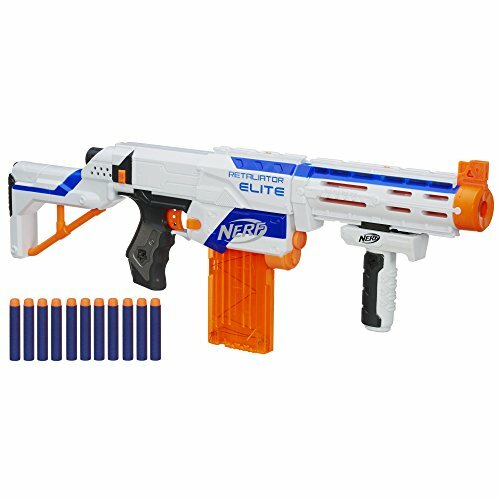 The Nerf N-Strike Elite Retaliator Blaster comes with a stability handle, stock and a barrel extension. The Retaliator is very much like the (powerful) Nerf M-4 Primary Gun, allows you to set up in 4 different configurations, and is a fantastic stealth-shooting blaster. The Nerf Retaliator Blaster provides you with a feeling that you really are in an Elite battle and with this weapon, you can get a realistic combat experience. Hint: click or tap the stars for the most helpful Nerf Retaliator Amazon reviews. Nerf Retaliator mod kit & step-by-step guide coming (very) soon. Click here to be the first to know when it's ready! Nerf Retaliator range test coming soon! Get the Retaliator Mod Guide!